Feynan’s ethos and work has earned it numerous international award, including being chosen by National Geographic Traveler as one of the best 25 ecolodges in the world. Feynan Ecolodge is more than a hotel; it is a destination that offers guests a plethora of unique and authentic experiences engrained in nature, adventure, culture, history and food. Everyday guests have a choice of activities to join in the daily schedule of guided experiences, including hikes in nature, canyoneering, visits to historic sites, Bedouin (local community) cultural experiences, mountain biking, stargazing, cooking classes and cooking demonstrations. Socially, Feynan benefits the local community, the conservation of Dana Biosphere Reserve and the environment at large. Direct local employment: Feynan employs all of its staff from the local communities surrounding the Dana Biosphere Reserve. This helps create the uniquely authentic atmosphere in the lodge, while generating much needed income for surrounding communities in an area where there are few jobs and poverty is a serious issue. The candle-making and leather workshops on site give women in the community the opportunity to work to help support their families and showcase their art. Local drivers provide shuttle services to and from the lodge in their own pickups in their free time. All the money paid by the guests for this service is given to the driver. This service benefits more than 43 families from the local Bedouin community. Feynan purchases most of its food supplies locally from local shops in the nearby villages. The bread the lodge serves is supplied by a local Bedouin woman, Um Khalid, who runs her own bakery business from her tent. She has one client only: Feynan. The Bedouin cultural experiences, such as the ‘Bedouin experience’ and the ‘Day with a shepherd’ are provided by 19 local families. Those experiences give guests insight into the Bedouin traditional way of living and provide the community with additional economic support. All the candles that light the lodge at night and the leather furniture items around the lodge are purchased from the onsite leather and candle workshops. A shop at the lodge also showcases and sells a great deal of artisan crafts and artwork from local communities of Jordan’s nature reserves. 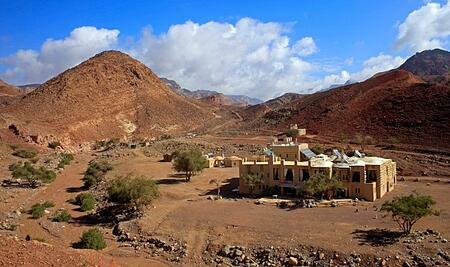 Feynan Ecolodge is a major contributor to finance RSCN’s conservation operations in Dana. Based on the historical caravanserai the lodge is designed with an integral courtyard linked to outer patios providing soft breezes and shady spots to rest. Perpendicular outcrops on the lodge’s facades shade outer surfaces and provide aesthetically appealing contrasts. These design features help reduce hot desert temperatures. Solar power: Feynan is not connected to the electricity grid. It generates 100% of its own electricity through solar/photovoltaic (PV) panels mounted on the roof top and electricity is stored in batteries. Only essential electrical appliances are used. The kitchen, washrooms and office are the only areas with electrical lighting using low energy LED bulbs. Appliances such as the refrigerators in the kitchen are Energy Star (US rating) or A/A+ (EU rating) certified. Laundry is air dried. Daily electricity use is restricted to 16-18 kWhr, less than a typical two bedroom apartment in Amman. Heating: The area around Feynan is quite warm and only requires heating for a short part of the year. For 60-90 evenings each winter, waste from olive pressing known as jift in Arabic or olive pit charcoal is burned in the two fireplaces at the lodge to provide heat. This preserves Jordan&#39;s trees and utilizes a renewable source of energy that is a natural by-product of Jordan&#39;s annual olive harvest. Using jift saves around 4.5 tonnes of trees being burnt annually. Composting: To minimize waste and utilise resources, the lodge has composting facilities where uncooked food excess and waste are transformed into organic fertilizer. Eliminating PET disposable water bottles: Feynan limits its use of plastic and encourages our guests to do the same. We offer water to our guests in locally produced clay jars to eliminate disposable plastic water bottles. Reusable water bottles are also available for our guests to take on hikes and excursions. We also have a complimentary filling station for guests to re-fill bottles at the lodge. By introducing these policies Feynan has manages to eliminate the use of around 15,000 PET disposable plastic bottles from the environment annually.  Wadi Araba is a conservative area where women are largely unemployed and stay home to care for their families. 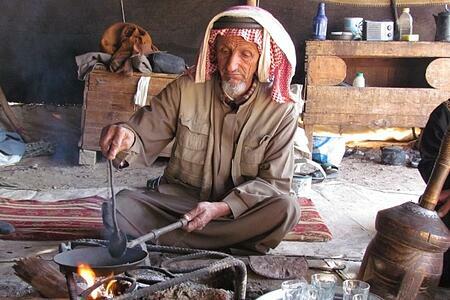 Um Khalid is a member of that community, a local Bedouin mother of 5 living in a goat-hair tent 1km from the lodge. Since the establishment of the lodge, Um Khalid has been running her own bakery business. She has one client; Feynan Ecolodge. Three times a day, she bakes the shrak bread needs of the lodge. She is now the main breadwinner in her family. The minimum wage for full time work in Jordan is 225JD, most of the local community in the village near Feynan are earning minimum wage. Um Khalid works approximately 3 hours a day and earns nearly twice the national minimum wage with an average of 400JD per month. Through her business, she has managed to save enough money for her family to buy and install a photovoltaic system bringing electricity for the first time to her goat-hair tent. Her daily chore of washing the clothes of her family is now done by her newly acquired washing machine and her children now have light to study at night.